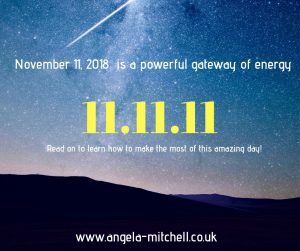 November 11, 2018 is a master number day so listen up. 2018 is a 11 year (2+0+1+8 =11) so Nov 11 is a 11-11-11 day. 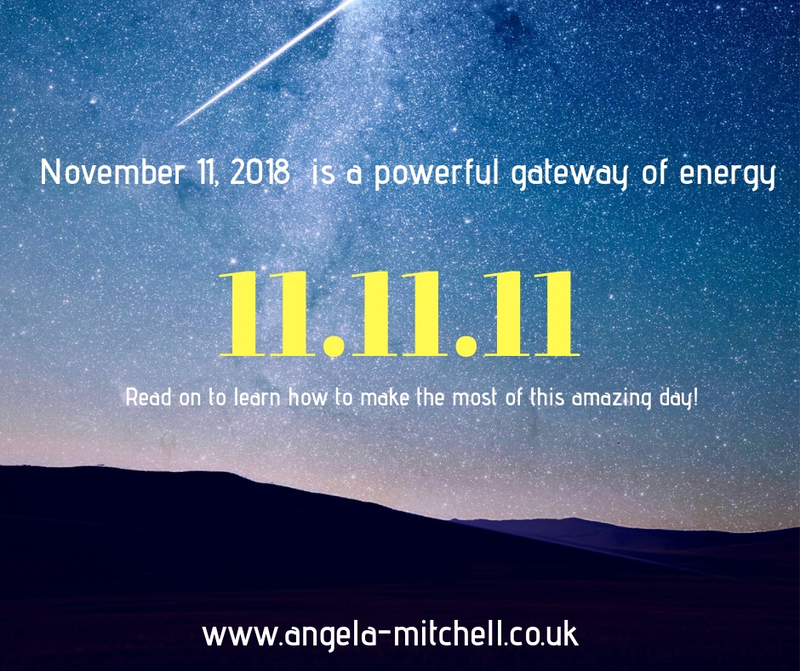 11 – 11 is a gateway for new energy and this falling just a few days after the New Moon brings in an extra dose of light. November is our PUSH THROUGH month. Some of us have seen major transformation from personal attitudes, business, and changes in situations to even relationship statuses. 2018 has allowed many of us to face our truth. November is going to push you forward and help get you ready for 2019. We will receive a high frequency of energy and healing this day. So please keep your thoughts positive, write in your gratitude journal or jar. You have nothing to lose by refocusing on the good stuff and what you would like to welcome to your life. It is free and if it works then it will magnify the good and help you achieve your dreams. Equally if you only focus on the bad and the “it won’t happen” stuff then you are really manifesting the “crud”, the things you should be letting go, not keeping in.I have already seen some changes in the energy around. More and more people seem to be open to Spirit and spiritual discussions. We are being asked to be more authentic, pure and speak the truth. 11-11-11 is also a “SIX” day which is all about dreams, seeing clearly, and opens a new gateway to be able to manifest your heart’s desires. So focus on the light and the love. This is special and a rare opportunity to truly focus on what you need in your life. People sometimes tell me that I make it sound simple and easy, this whole “keeping positive” nonsense and “does it even work”. My answer is always the same. It cost your NOTHING to try to be positive and to focus on what you WANT. It is like setting your coordinates on your SATNAV. It tells your SOUL what you want so it can guide you. You must also take action. It is like wanting to win the lottery but never buying the ticket. As they say, you must “be in it to win it”. Do your moon rituals, keep a gratitude journal or jar and try to focus on what you want so you can receive double the amount. Just like a magnet, energy is made up of positive and negative. So if you keep on the positive it will attract and bring more of the same to you and vice versa. Have you wondered why sometimes when one bad thing happens, a series of the same appears in your life? The challenge is to not let the first negative event to derail you. If you show strength and tenacity to hold on despite the storm then you will make it out and push forward. Keeping this in mind, use the energy of 11.11.11 to push through the storm and reach for the rainbow at the end. Now here is the thing, the WHOLE of NOVEMBER is scattered with this master number! 1, 10, 11, 19, 28 and 29 are all master days. I found October really difficult and slow. Things felt incredibly sticky and plans kept changing all the time. It was almost as if the Universe was playing with me. So yes it was incredibly frustrating but I felt the energy truly change after the 31st! By the first I had good news and things felt different. The same things which felt difficult in October is EASY now. So yes there is a huge amount of insight and ease this month. I am particularly excited as my birthday falls on the 29th which is another 11.11.11 day! It is not always that your birthday falls on a master number day. Does your birthday fall on a master number day too? These last few weeks since the Beaver Moon on Nov 5th has been challenging for most. In my free guidance earlier this month, I spoke about Force Majeure which is about superior force or something out of our control. How many us faced situations not unlike a tornado with spiralled out of our control? I know I had one where I felt I was caught in the middle of the eye. I was put under considerable stress and prodded to breaking point. Luckily self control and diplomacy helped but my goodness, it was intense. 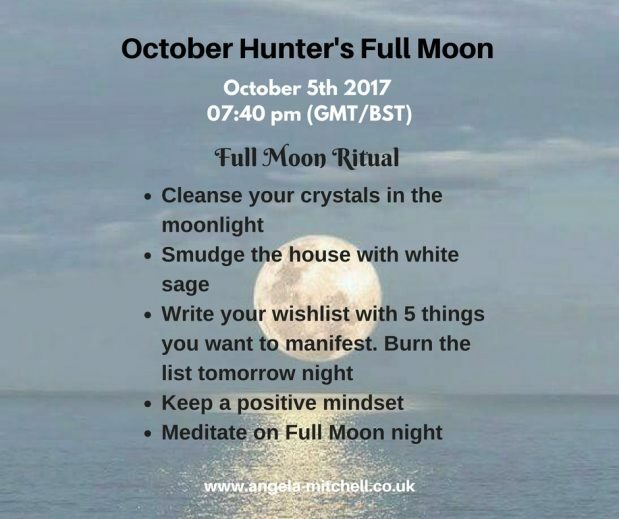 One of the main themes of the last full moon was “water” and this lead to very disruptive emotional state of mind and communication problems. Emotions were definitely running wild, within our minds as well with our relationship with others. Bear in mind that this year is all about transformation and change. This means that the change is triggered IN us so there is a domino effect in terms of how you get along with people, feel about them and even treat them. The change within will determine the rest. So yes, the next couple of months till February will be emotional and communication can break down if were are not careful. The New Moon in Scorpio brings some stubbornness and determination. Don’t try to cut off your nose to spite the face in trying to “stand your ground”. Consider your options and listen to what people are saying before you react. There may be some truth in it or learning lessons so don’t dismiss everything as a negative. Scorpios are generally very passionate, focused and want to know more. New Moons are the start of a new cycle and a fresh start to old problems. So think of what you are passionate about and how you can change your focus, to make it work for you. A change in perspective brings new solutions that were otherwise hidden by our one dimensional outlook. This New Moon encourages us to “declutter” in more ways than one. How many of you have been feeling like you need to downsize or declutter the home? You may be looking at reviewing your friends list to see who has been “naughty or nice”. Imagine you want to climb Mt Everest but have a big trolley bag with you instead of a bagpack. You have the wrong luggage and too much of the wrong things with you, weighting and slowing you down. The moment you stop being stubborn and throw out the stuff you don’t need and only take with you in a smaller bag, what will be useful, will you succeed in your journey. As difficult it was to let go and get rid of the “stuff”, which are familiar and what you thought you needed, it felt good to have less. Now imagine that the stuff you threw away were negative emotions such as procrastination, self sabotage, anger, addiction to food or substance or even people, stubbornness, laziness, passiveness or even defeatist attitude, or people – those who bring you down, encourage you to stay in your comfortzone, those who push your buttons, those who tell you what you “want” to hear, then your load will be much lighter. The universe can’t help you manifest the life or the things you want if nothing changes in how you live your life. It can push you into the right direction but you need to be in the right mind set to see the opportunity and to accept it. Nothing will change until we get rid of the “junk” in our lives, freeing up space for new ideas, people and emotions. How to help the Universe help you? Write your intentions list – put down all the things you want to let go off. Be realistic and don’t try to hide from yourself. Put down exactly what frustrates you about you. Why do you think some of the situations occurred in your life? Be honest and stop blaming others. Put it down on paper and let yourself free. Take it out on Saturday evening and face the night sky and feel the energy of Mother Moon. Speak to her in your mind and go through some of the negative situations caused by your own limitations. Tell her that you are ready to let go. Say this three times – “I let go, I let go, I am ready to let go” Burn the list in a safe place and ensure the flames are out before you enter the house. Smudge the house using Frankincense or White Californian sage. For detailed instructions read my free guidance. Cleanse your crystals – You can either drop your crystals in a bowl of filtered/cooled boiled water with some selenite to self cleanse or leave it outside to be fully energised and cleansed by moon energy. Use the water the next day to water your plants. Declutter – the house. Get rid of things you really don’t need. Create space for yourself in the house. Giving things away can be therapeutic. Put pen to paper to see who has been creating most of the drama in your life recently and ask yourself if you need to step away from them for a while? Happy New Moon and New Beginnings to you all! Tomorrow’s Full Moon falls on a number “7” day which has a high spiritual vibrancy. These is one of those stand alone number days aligned with the lunar calendar which can be interesting energy wise. What will be compelling is the need to break free from the norm and to be more “individual” in your approach. A word of warning through, as this could lead to fractious relationships and situations. Plan and do your leg work before acting as there is a tendency to be reckless at times when these sort of days appear in our lives. Nothing to worry about, just double check everything and think things through before acting. The Full Moon falls on 5.10.2017 which if we added the numbers up, 5+1+0+2+0+1+7= 16, totals to the number 7. Seven brings solid foundations, spiritual pursuits and a hunger to learn more about your personal direction and universal energy. Most of us will find that we want to “shine” and be heard not just seen. This is the time to step out of the shadows and be true to yourself. The lunar energy of 2017 has so far been pushing and prodding us to get to this point where we can let go of fear and to stop being comfortable in the shadow aspect of our personality. The time has come, with the help of the universe, Spirit and the powers that may be to step forward and be counted. *If you have been feeling a little spaced out or like you are about to get a cold but never does happen, then listen up. This means that you may have a number of things on your mind, and struggling to focus on one productive thought or project which could push you forward. Decision making is not your strongest point and you are likely to be led rather to lead. Tomorrow’s energy will nudge you out of your comfort zone and force you to make a decision. So take charge, put everything on paper and go through the list and let your intuition guide you. *The other physical symptom some of us have been experiencing and which is rather common during the lunar cycle is headaches. Our natural instinct, consciously or unconsciously in the face of change, is to resist. The lunar energy will be draining as it will be using up energy from within our physical body. This reduces our water content and causes us to be dehydrated, which we know leads to headaches and imbalance. It is always a good idea to increase our intake of filtered warm or room temperature water close to the New or Full moon. Lunar cycles enhance our ability to detox and rid ourselves of limiting believes and the shadow, which inevitably will cause our body to detox as well. Water will accelerate the process and flush everything out. The more spiritual rationale for headaches close to a lunar cycle is resistance and mental conflict. It is likely that you are over thinking something and putting a considerable amount of stress on yourself for no reason other than to want “perfection”. You are likely someone who feels they “have to” rather than “want to” therefore piling on the stress to be everything to everyone. The more you left go of this need to be perfect, the headaches will ease this week and you will find clarity and determination. The message for this full moon cuts deep into our core, the essence of who we are and where we want to go. If you act on your feelings, learn from it and use this guide then transformation is possible. There is a call now to stand up in your own two feet, to be an individual rather than to hide behind others. The time is ripe for you to take charge of your life and your career. You CAN do it on your own. The energy is particularly powerful and can, often be life changing if tapped into properly. Stop hesitating and use your practical and sensible self to clearly etch out a plan. Big yourself up at work and stand out! This is also the time to put yourself FIRST. Bump yourself up on the list of priorities and make yourself the VIP of your own life. Stop running around for others. Look after yourself, be kind to yourself and be there for YOU. So go book a spa day, treat yourself to a nice lunch, create space in the house for your hobby, spend some time on your own, go out and have fun or even just get your hair done! Do all the things you have put off because you don’t have time, money or that others need it more. The Hunter’s Moon appears on our skies earlier than regular full moons which means the dusky sky is illuminated brilliantly by the full moon (weather permitting!) which gave the Native Americans in ancient times, more time to hunt. This is the signal for the winter preparation. This means in our modern times, that we are given a unique opportunity to take a leap of faith and to be true to ourselves. The bright light of the moon will illuminate our shadow self to transform and learn. Tomorrow’s moon will give you the strength and conviction to step up and let the light shine on you for once. Take advantage of this gift from the universe and do the full moon ritual to accelerate the energy right now. Follow the steps on the guide here or if you want an in depth explanation on how to cleanse your crystals, smudge the house and to write your wishlist then read my complete moon ritual guide here. Please feel free to share this guidance with family and friends. I love hearing from you so please do leave a comment if this resonates with you. * Obviously with any symptom, you must first ensure that there is no underlying medical reason. This is not a substitute for professional medical advice. The Worm Moon will be fully realised tomorrow afternoon at 2.53pm. This Native American name is such as this is the time when the ground starts getting warmer, and the earthworms encourage the robins and other little birds to appear again, after winter. Spring equinox being a week away, and Mother Nature in most parts of the world is rebuilding and working furiously to bring it back to life. Mankind should take inspiration from nature. Has nature ever stopped because it had a harsh winter? Has a squirrel given up because its tired of climbing up trees and running around? Animal kingdom are curious, innovative and have great focus. They don’t give up because survival is key. We humans have lost our ability to hunt and survive. We merely exist these days as there is no need to fight, strategise or hunt for our meals. We are instead driven by convenience and choice.Unfortunately this does mean we tend to give up easily, feel entitled and often stubborn. So if you have been having a “curl up and die” kind of feeling lately, sit and reflect on how you can work through this situation. There is ALWAYS a solution. Allow your inner voice – your guidance flow. Don’t let your ego try to talk you out of things. Some of us can fall into thinking that you need to grapple with problems alone or feel ashamed that you are in a particular situation. Please don’t feel that you need to do it alone. You never know who can help. I remember someone posting in a Facebook group about her situation having had to start over again in a council provided flat. She had absolutely nothing with her as she had to leave the home she shared with her ex in an emergency. It took courage for her to swallow her pride and post in a forum with thousands of people. She wrote her post with so much humility and she was embarrassed. She didn’t expect the huge wave of verbal support, encouragement and material help. You see people will JUDGE and have an OPINION on practically any aspect of your life but why focus on that? Why fear the inevitable? Put your hope and intentions on the solution not the fear. The key is in love and positive thought not fear. So let tomorrow’s full moon illuminate your current situation with clarity. You will find that there will be a need to rebuild. Sometimes the best way around a problem is to tear it down and start again. 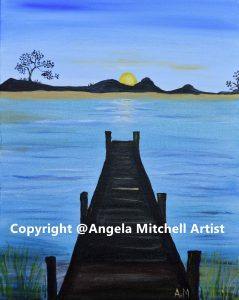 I have learned during painting that if it starts dragging on the canvas and something is harder than it ought to be, its time to put the paint brush down. I take a step back and look at the overall picture. I remember painting a man who was native american and no matter how hard I tried, I couldn’t get his left cheek right. The colour wouldn’t sit properly, and it seemed like I didn’t know how even though the left cheek was perfect. recorded image of him but he wanted to show himself to me. 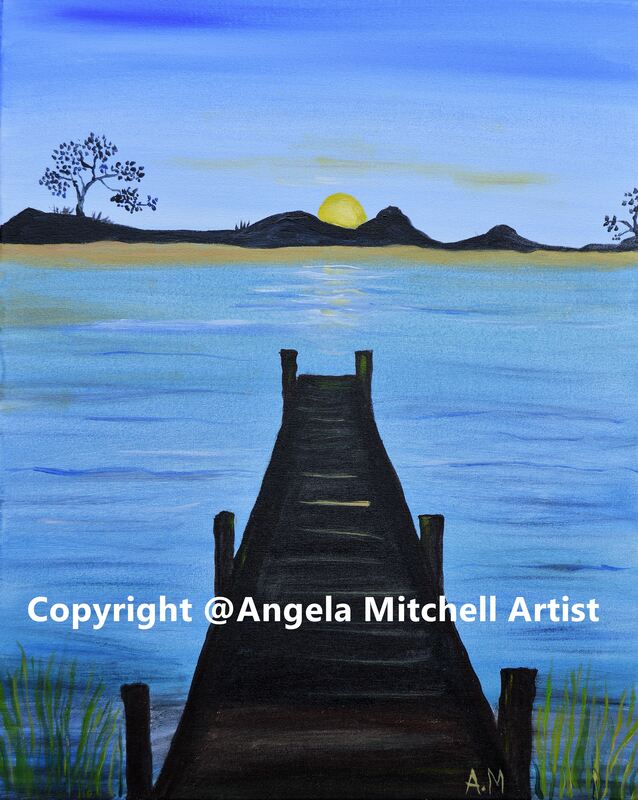 I was truly grateful for this moment and with his permission, painted over the image. I think if I k ept trying to repair his cheek and ignored the message he was sending, I would have ended up slashing the canvas with a knife and thrown it away! So step away from your problems and look at it differently. Don’t be afraid to reach out to people for help and don’t fear stop you from starting over. Sometimes the magic happens when we tear everything including our defences away. I am doing a free Angel guidance reading on my Facebook page.Why don’t you go over to my page, follow the instructions and pick a card. I will be writing a full channelled report on each card’s meaning and what I feel the Angels want us to know about our week ahead. PICK YOUR CARD. Please do tag your friends or family who may want some guidance too. Its becoming increasingly difficult to be visible as a page on Facebook due to all the algorithms imposed by Facebook to encourage us to spend a lot more on adverts (which very rarely bring in results) so really helpful to have posts and pages shared. I will be teaching my Full Moon Manifesting workshop tomorrow. How appropriate as we will be starting about the same time as the full moon! 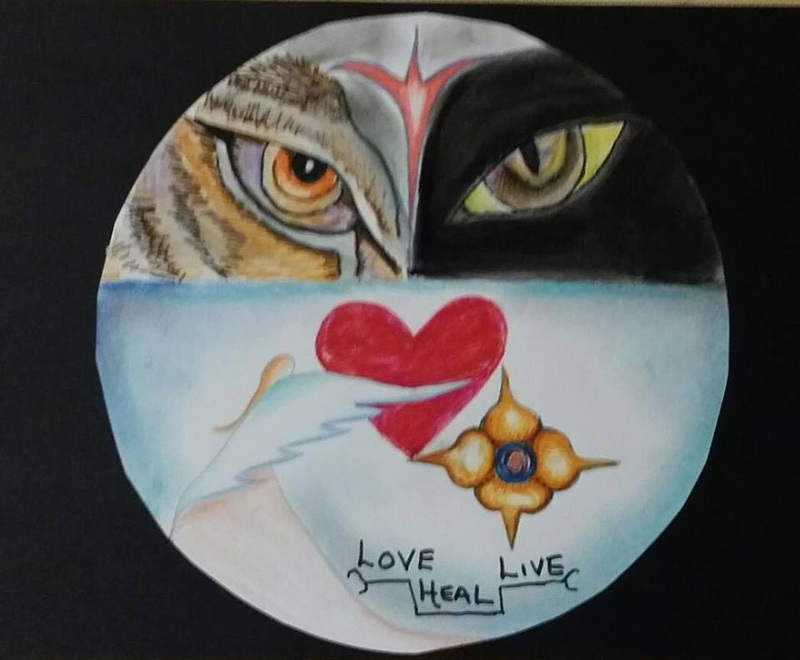 Please do read and share my Moon Ritual FREE Guide. I love feedback so please do drop me a message if you have any suggestions, ideas or topics you would love me to write on. I want this to be a useful and insightful message for you to receive. People often find my life and my work in particular, fascinating. It is probably because I really love what I do and I am passionate about it. I have experiences which I cannot even share sometimes for fear of being called “weird” or to avoid being questioned on its authenticity because it is not part of their belief system or reality. Being a medium is very much about being open to experiences that the Spirit world want to share with us. We get to astral travel, connect with spirit in every shape or form, hear, see or even taste, as our senses are heightened. Growing up as a child in Malaysia, I used to grapple with the dark and sleeping alone. I had times where I would wet the bed because I was absolutely terrified of my experiences. I mean wouldn’t you be if you saw a being move up around the ceiling? Feel a tightening sensation spread across your entire body? Now, what if I told you that I had just got into bed so was awake and my eyes was CLOSED but I could see through my eyelids? I could see every detail of the room. This was because my third eye had already developed when I was ten I could see through it sometimes. After my rigorous training and spiritual development, which led to working professionally as a Medium, I am never afraid of Spirit. I don’t feel the same way about “visitors” as when i was a child. I know that tightening sensation now was energy and the being I saw was probably a guide or from a different dimension. If only I knew what I know now then! On Friday I unintentionally stayed up awake. I had a workshop to run in the morning so I was keen on an early night. However earlier in the day, my mother called to remind me to try to stay awake for Mahashivatri – a night in tribute to Shiva which takes place before a new moon. The theme for this annual spiritual celebration is to overcome darkness and ignorance. This is a very important event for those who believe in the mind, body and spirit connection. Shiva is seen as the master that teaches, improves and oversees this aspect of humanity. People fast, eat vegetarian food, meditate, chant and spend the time on self reflection. Most temples are awash with lights, colour and people sitting with their legs crossed and spines straight throughout the night. There are 12 Shivaratri per year but the main one, usually falls in February or March. This year it was on February 24th. This special day is huge for those on the spiritual path as Shiva, helps to awaken new spiritual awareness and gifts. With all of this in mind, I decided that I couldn’t stay awake so I went to bed armed with some guided sleep meditation music. After tossing and turning, I decided to sit up in bed and listen to some Shiva chants from my Youtube channel. I am hesitating as I write this as I know it will sounds completely crazy! I felt my soul leave my body and there was a short moment of grief which was overtaken by excitement. I then saw below me, the road outside my house. I continued to travel up and then I felt myself, so light and weightless, travel further up into the sky. After a moment, darkness surrounded me and I thought that was it. I then realised I was in a cave. It was a big one with a lot of space around me. I could’t see the top but the wall around me had what I initially thought was graffiti but on closer inspection, turned out to be pre-historic drawings. I could sense water running close by but my attention was taken over by the fresh air and light that I suddenly felt. I saw the opening and then heard the shriek of the flying prehistoric animal that flew past me. I saw it in the distance and then the massive landscape below me. It was a beautiful sight and simply indescribable. I have had out of body (OOB) experiences before but never so vivid and to a different time in history. Once I felt I was back on the bed again, I saw my father standing near me and next to him, a guide and someone else. Before I could take that all in, waves of green, white and sparkly yellow light spilled into the room. The door was closed, the curtains drawn and my eyes were shut. The lights formed long continuous and intersected lines moved and danced around me. I felt so honoured and happy to be a witness to this special scene in front of me. In the corner of my eye I saw several other lights but these were different. They were like the lights of stars we see in the sky. Bright, determined and powerful. These I knew were lights of Spirit and Angels. They sparkled and stayed passive while the green/white light made patterns around me. They reminded me of the Aurora Borealis lights. There were a few more other things that happened that night but thankfully I managed to fall asleep at 5.30am and had less than three hours of sleep before my event. I didn’t feel tired at all while I was teaching and I came home really energised. On Saturday night, I was filled with so much energy, and I knew one of my guides wanted to work with me. So I asked my husband to go off to bed while I picked up my paint brushes and set to work until 4am. 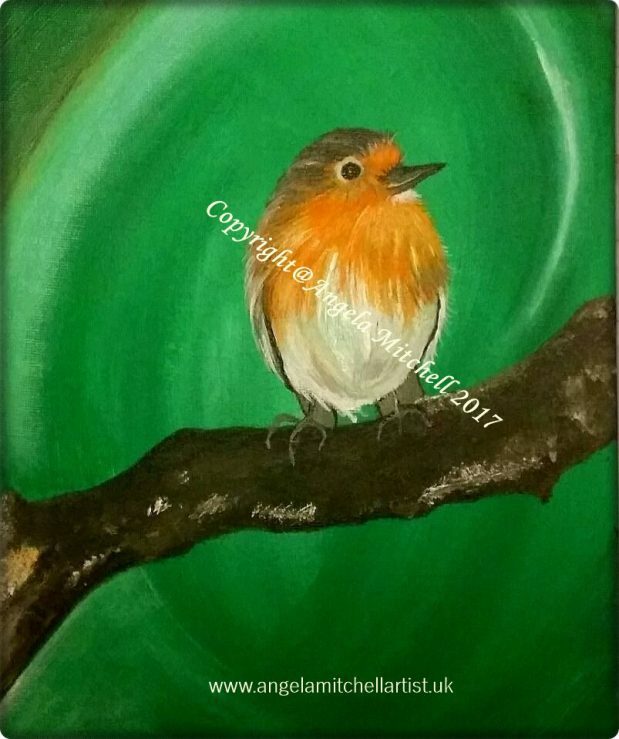 I just knew I had to paint a robin but I never paint animals or landscape. My art is from inspiration so I was a little apprehensive. I couldn’t believe how easily the robin appeared on the canvas. A very curious, inquisitive, and friendly fella who looks like he has had a rough time. Somehow he found this little haven away from the rain to rest. While robins are often referred to as spirit signs, they are in Shamanism, a sign of growth and renewal. If you look back at the New Moon & Solar Eclipse guide from Friday, there is a theme about renewal there. Scruffy brings with him a message about letting go of the past to be able to move forward in the present. When we work to release the past, then you can refresh and go on your new journey. He also helps with self expression and working hard but also resting. We must listen to our bodies and the signs, to know when to push ourselves and when to take time off. Scruffy wants us to know that our spirit family and friends are working hard to send us healing, in every possible way. From a chance meeting with someone who makes you smile, to unexpected abundance to closure on a disagreement. Believe that change is coming to your life and things will work out. Scruffy is currently on sale at the Craft Coop in Marlow High Street.